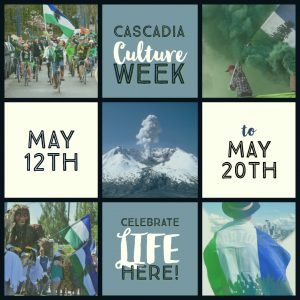 What is Cascadia Culture Week? For Cascadia Culture Week 2018 we recommend taking some time out to REFLECT, COLLECT and CELEBRATE. REFLECT: Taking time to observe and appreciate our beautiful bioregion is central to being Cascadian. Cascadia Culture Week gives us all a chance to think about what we love about here, and how we are acting to preserve it. Whatever your passion; nature, family, wildlife, sports, consider one thing you can do this year to have a positive impact on that corner of Cascadia. COLLECT: Cascadia is about community and the strength that comes from interdependence. At the core of bioregionalism is the principle that all living things here rely on the same three watersheds to survive. Everything from the eagle to a salmon is a part of the same water collective. We can do much more united than divided. So this Cascadia Culture Week is the perfect time to get your collective together at work, school or home and ways you can better assist eachother, our bioregion and the earth. CELEBRATE: As summer approaches, Cascadian celebrations take to back yards, beaches and the woods as we relish in long days and warm nights. With Cascadia Day only a few days away this Friday, this weekend is prime time for a Salmon BBQ, Skinny Dipping in a mountain lake or searching for Sasquatch on a drive around one of the spectacular, provincial, state and national parks across Cascadia. Wherever you are, it’s easy to celebrate Cascadia. Of course the easiest way to celebrate Cascadia is with a Flag Swag, Sasquatch gear and to fly your Doug. Whatever you do this week, don’t forget to show us on social media how you celebrate #CASCADIADAY! Make sure to share by tagging @cascadiaunderground on FB, Instagram, Twitter, Tumblr or elsewhere. #Cascadia #CascadiaUnderground #CascadiaNow #CascadiaCW and we’ll share them out! Know of a cool event, or want to share one? Submit an event to our community calendar or share on social media and tag us and we’ll share it out! One of the best things to do is to host a community event! Host a potluck, salon, discussion, art party, political card writing with friends, put up posters, reach out to businesses, organize a music night, a movie night, or a reading book, go on a hike with friends, get active with a cause or organization you love, throw a fundraiser for a cause, then email us or fill out the form to hook it in so we can share it out! And lastly, make sure to join the Cascadia Convergence this year, happening June 31-July 1 in SW Washington.